Ketchum resident Melissa Arnot perches at the summit on her record-breaking climb of Mount Everest earlier this year. In the foreground are Himalayan prayer flags placed at the site by her Sherpa guide. Courtesy photo by David Morton. This spring, during the deadliest season on Mount Everest since 1996, Ketchum resident Melissa Arnot was helping others summit for the first time and helping fellow climbers in trouble—and she was also breaking a record. This season, Arnot, a professional mountain guide who has lived in Ketchum since 2008, became the first woman in history to summit Mount Everest four times. Her trip to the Nepal Himalayas this year was part of an expedition sponsored by retailer Eddie Bauer to commemorate the first American summit of Everest in 1963. Ironically, Arnot said that there was no unusual pressure for her this year on this climb—despite the record hanging out there just waiting to be broken. She said she didn't know that four summits were the world record, and in any case, it wouldn't have changed her experience. "That's not at all what this was about for me," she said. "Chasing a record is definitely not what drives me to climb. I enjoy just being there." Arnot's third Everest trip in 2010 was much more stressful, she said, as she was attempting to reach the summit without using oxygen. Climbers use oxygen both because the air is so thin and also to help keep warm, Arnot said, as oxygen in the blood helps keep extremities warm through circulation. She said no American woman has ever reached the top of Everest without the aid of oxygen—and she did not become the first. "I had to use oxygen from 27,000 feet and above," she said. "There was a lot going on, there were a lot of people and it was cold. There are so many factors to being able to climb successfully without oxygen that I decided it wasn't right for me." 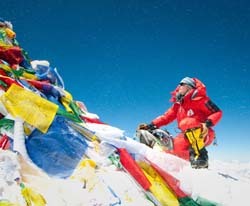 The next season, 2011, Arnot spent at a lower elevation but completing more technical climbs on nearby Makalu. "It's much more technical and much more difficult than the standard route on Everest," she said. "We were climbing unsupported with no Sherpa, no support staff." After turning back just 200 meters from the summit, Arnot and a partner then went to Everest but did not summit, climbing 26,000 feet to the mountain's fourth high-altitude camp. Arnot did not reach the top that time, she said, because it was so late in the season. "We were the last people there, and if anything had happened, we'd be in a really bad position," she said. For her record-breaking climb, she said, she was climbing completely with oxygen and guiding a client who had reached the top before and was therefore somewhat experienced. "Going this year, it was a lot more calm," she said. "It was like, 'Oh, perfect, climbing with oxygen, with a client who has summited before.'" Arnot began mountain climbing with a friend in 2001. She is originally from Whitefish, Mont., and though she left to attend college in Iowa, returned to her hometown after graduating and fell in love with climbing and wilderness medicine. She quickly gained her EMT certification and became a paramedic in Montana before becoming a professional mountain guide with Rainier Mountaineering in 2004. "From 2004 to 2009, I guided full-time on Rainier every summer," she said. "I climbed it 30 times a summer." She scaled back after she broke her leg in 2009, and began guiding only five times a year. "I realized, hey, mountain biking is much more fun in the summer," she said with a laugh. Still, Arnot credits those early years on Rainier with giving her the ability to move on to the Himalayas. "That is how I learned to climb," she said. "I spent three to four months on a glacier in crampons, because Rainier is fully glaciated. That's where I got the skill set to be able to climb the Himalayas for sure." Arnot has worked on expeditions across the globe, including Summit on the Summit, a trek that involved a group of celebrities and activists who climbed Mount Kilimanjaro in 2010 to raise funds and awareness for those without water in Ethiopia and Tanzania. Arnot said that trip—technically a high-altitude hike, not a true mountain climb—had a unique set of challenges. "I had people who had literally never slept on the floor, let alone outside in a tent on Kilimanjaro," she said, adding that all 45 climbers made it to the top. "It was a small miracle," she said with a laugh. It's hard to imagine how Arnot will top her latest climb, but she said she thinks about combining her love of mountains with her medical knowledge and raising awareness of the medical needs of Sherpas who are injured or become sick on the mountain. But she said that she won't stop climbing. "I'm just now getting to the point where I can entertain [going back to Makalu]," she said, naming it as one of her best climbs. "It's so hard to imagine ever subjecting yourself to that difficulty ever again. I always say, give me a month after I get back before you start asking me about my goals, because I have a hard time imagining putting my boots back on right now."